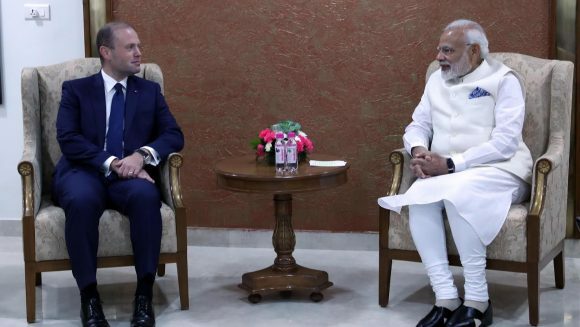 The possibility of Air Malta commencing flights to various cities in India was discussed during a meeting between Prime Minister Joseph Muscat and Indian Prime Minister Narendra Modi. The proposal was discussed in the context of Air Malta’s expansion plans. The meeting between the two PMs took place in Gujarat State at the start of a summit meeting on investment and commercial fairs. At the summit opening Dr Muscat said that without entering into the merits of what is happening in the United Kingdom, a number of Indian companies are finding Malta as an ideal alternative to have an operational base in Europe. The meeting took place prior to the inauguration of the Vibrant Gujarat Global Summit that is organised biennially to promote what the Gujarat State has to offer and brings together delegations, investors and entrepreneurs from different countries for informal discussions aimed at promoting and engendering commerce. The aviation discussions centred on the fact that Malta may be a destination for Indian citizens in areas where there is a lack of connectivity flights for them to travel to other European or North African countries. Dr Muscat said Air Malta’s proposals for such flights to provide connectivity did not involve major cities like Mumbai or New Delhi but would be aimed at smaller localities. He said his Government believes in the possibility of such flights because in the smaller cities no provision is currently available for long-distance flights. He said such flights would make Malta more competitive. A partner would be needed to operate this but the sustainability of such a system is being investigated and if this proves positive there should be no difficulty for the Indian Government to find the right partner. Discussions also featured pharmaceuticals, innovation, information technology and possible cooperation on blockchain. The Prime Minister is among five Heads of Government invited to attend the summit. During the opening ceremony Dr Muscat delivered a presentation on Malta’s economic results which he said had resulted positively mainly through a reduction of bureaucracy. He mentioned Indian investment in Malta such as Streamcast which has partnered Enemalta and operates a data centre from the former Marsa power station, as well as Aurobindo, a pharmaceutical company that has its European base in Malta. Dr Muscat said he is eager to receive further Indian investment in Malta. He said that Indian companies and Indian families who had relocated their business in Britain because of historical Commonwealth links as well as the versatility of the English Language but now need to relocate their business to a place where English is spoken fluently and which has Anglo-Saxon systems traditions would do well to consider Malta as one of the three or four localities within the EU that offer such facilities. Dr Muscat said individual discussions are taking place and he believes that some companies have staged a low presence for the moment but their expansion could be a great possibility. This is the Prime Minister’s first visit to India and continues to build on previous recent visits to Japan and China last summer. The three visits during the last six months were aimed at not only strengthening political relations in the Asian region but also to promote further investment and employment opportunities from the Asian continent.